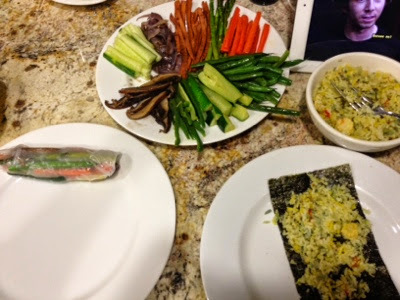 I found rice paper circles in my local health food store and wanted to try to make veggie wraps using the rice paper and seaweed. i steamed carrots, green beans, asparagus, and zucchini. I grilled mushrooms, onions, and tofu hot dogs. And lastly, i cut up some cucumbers, avocados, and green bell peppers. I had such a hard time rolling the rice papers. i have no idea how people do them so well! 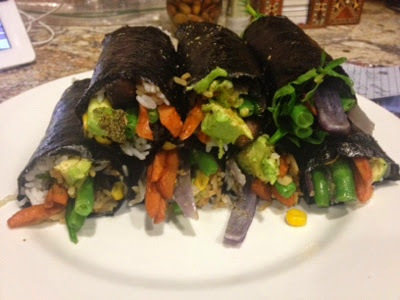 i put down rice on both the rice paper and seaweed then various veggies and rolled them up. I added chili oil to some as well as nutritional yeast. they looked awful but tasted great! pictures after the jump.